RESERVED SEATING. TAXES ARE INCLUDED IN ALL PRICES. Please call us for pricing and seating availability for groups of 15 people or more. Child tickets must be accompanied by at least 1 adult ticket. Lap children ages 3 and under that do not require their own seat are FREE. 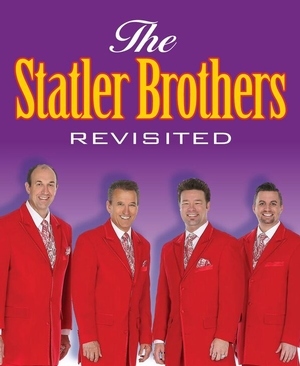 The “Class of ‘57” presents Statler Brothers Revisited. This quartet and their band reproduce the smooth four-part harmony that made the Statler Brothers an American institution. Their singing is modeled on the tradition of Gospel Quartet singing, but with songs related to their country roots. Enjoy great songs like Elizabeth, Flowers On The Wall, Do you Remember These, I’ll go To My Grave Loving You, Class Of ’57, Whatever Happened To Randolph Scott, More Than A Name On The Wall, Turn Your Radio On and many more! Join “The Class of ‘57” in a short segment during their show when they pay tribute to Lester “Roadhog” Moran and his backup band, the Cadillac Cowboys. They were the legitimate talents of the legendary Statler Brothers as they comically spoof their roots in country music. Oh Happy Day - Goin' Back To Gospel!